This is the second in an occasional series on weekend clothes with a specific personality — see all the posts in the series here. Today: how to get the boho look. Accordingly, I thought it might be fun to round up different stores selling “weekend vibe” clothes in different personalities for our ongoing Weekend Wednesdays series. After all, we’ve talked in the past about the weekend you vs. the weekday you — as well as sharing our best tips for upgrading your weekend clothes and cultivating style in general. Last fall we covered “tough girl chic” — a flawed term for sure but one that I thought nicely conveyed the women whose ideal weekend outfit is a black t-shirt and black ripped jeans (raising hand). Today, let’s look at how to get the boho look. There are a ton of stores that appeal to a freewheeling, relaxed, “flower child” kind of mindset — even if you’re well past the days of planning outfits for Coachella. Some of the top stores you might want to check out to support your boho mindset for the weekend include some of the stores and brands below — note that a lot of do have workwear offerings as well. If the boho mindset appeals to you because you’re interested in slow fashion and sustainability, you may want to check out our Slow Guide Shopping Guide (which we’re in the midst of updating!). It’s been interesting putting this post together because I don’t necessarily think of boho style as something ONLY for the 18 year olds among us — but it can be more complicated to think of boho style for the slightly older set. I’ve tried to put together pieces below that I think professional women might actually want to wear on the weekends — but when in doubt think of older women like Stevie Nicks or Lisa Bonet as inspiration, and remember that boho style is very much about sustainability and comfort — yes please! 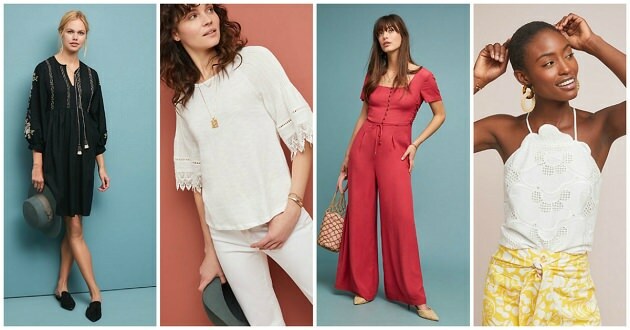 Look to more mature brands like Soft Surroundings, Eileen Fisher, or Johnny Was for ideas for how to get a more toned-down boho vibe without high-waisted denim short-shorts (I’ve heard them called “denim undies” and died laughing), crop tops, and mini-mini-skirts — even if those brands don’t 100% speak to you it will give you ideas for how to mix and match younger stuff and more traditional stuff. I always think of Free People as being ultra-wearable boho fashion for your 20s, 30s and beyond. 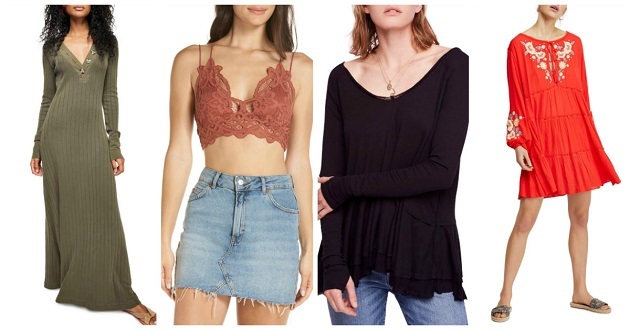 The bralette is pictured above not so much as an outfit suggestion (although hey, you do you) but as a note that a LOT of readers have called it out as being a super comfortable and pretty bralette to have peeking out of loose tops — and it does have more than 1000+ great reviews. 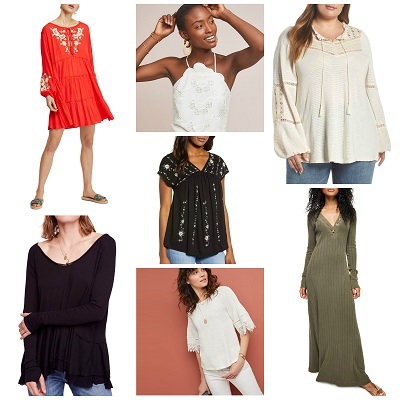 Free People makes some of my favorite weekend tees — soft, cozy, comfortable. I didn’t picture this tee that I’ve got my eye on because there’s nothing particularly boho about it but it looks like the one to beat this season as far as pricey t-shirts go. Anthro is a good shopping spot for a ton of personalities, from boho to artsy to a clothing style I can only describe as “I wish I were French.” Accordingly there’s a bit of overlap here between the styles. The white t-shirt with pretty sleeves pictured above also comes in black and feels like a particularly modern tone-on-tone idea for boho style. 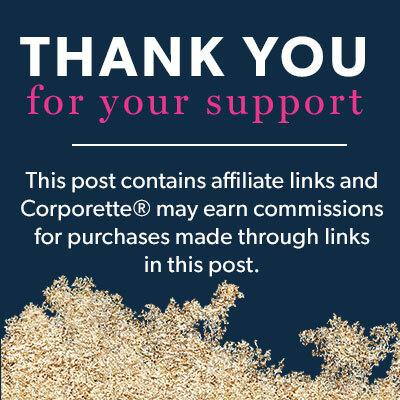 Note that Anthro is launching plus sizes very soon! Lucky Brand is definitely wearable boho clothes — easy to throw on for super casual weekends. I like that they come in a range of plus sizes as well. Lucky Brand is sold at a ton of places, including Nordstrom, Macy’s, as well as their own stores. I strive for a boho look on weekends at almost 50. I wear a lot of Free People tunics (the same one my daughter wears as dresses). I also agree that Anthro and Johnny Was – sometimes – are good sources for an age-appropriate boho look. BUT – Soft Surroundings and Eileen Fisher? No. No. My very stylish mother wears these. I want to establish a look for 37 year old women with long bodies and short legs. I’ve tried the tunic approach, but Dad says I look like an overgrown munchkin. Does anyone in the HIVE have suggestions for me? I am 5’4″ blond/blue eyes/ weigh 119 pounds, but with a long torso and short legs. My legs could be thinner, but it is genetic, so I am what I am. I also do not like the look Gwnieth Paltrow has now. I read an article about her in the NY Times the other day. I have so many of the Lucky Brand peasant-type tops that I wear on weekends. Some can actually be worn to my business casual office. It’s funny, because my 9-5 self is a very “twin-set, dress trousers” kind of look. I love the boho look, and do a version of it at a casual workplace. Usually a free peoplish type of look top, with a skirt— I’m in. My40s, and embrace all the boho style loveliness in terms of dresses on the weekends. My mom does boho artsy super well. She has White pants that skim her body, and end at her ankle. She has beautiful tops that range from artsy water colour prints, lace, and beautiful boho prints. It works well for her, but she gives it a edge with funky sneakers. I love the boho look on others, but it doesn’t work well on me — either personality-wise, or from an aesthetic standpoint. When I try on boho blouses, I feel like the Pioneer Woman (and not in a good way).